During my research for this article, I unsubscribed from almost thirty registrations with national brands and online retailers that have been sending me emails for six months or more. Although we all agree that retaining existing customers costs less than acquiring new relationships, every single one of these businesses ended their relationship with me by providing a stark white screen and some boxes to check. This article will explain why customized landing pages should be designed for “Unsubscribe” links. How Do Your Customers Tell You to STOP? There was a time, in the not so distant past, when my inbox was getting crowded with email marketing messages that I would start clicking, “Mark as Spam,” because it was the quickest way to make the emails stop coming. After all, I wasn’t about to open the email that I didn’t want in the first place, scroll to the bottom of the page, and get a magnifying glass out to read the microscopic print at the end of the email, which read, “Unsubscribe.” I’m not alone; a growing body of evidence suggests that you are expecting way too much of your customers if you believe that this method for them to de-clutter their inbox is reasonable – they will simply report you as spam. Nevertheless, I continue to see national brands and well-known online retailers using old-fashioned email marketing tactics. Google, being the online police that it is, realized that marketers were not taking it upon themselves to provide clear and prominent unsubscribe links within their email marketing campaigns. Consequently, Gmail just announced that it would be doing it for them. While marketers all shivered with fear at this announcement, the actual application ended up being pretty muted. As shown above, Google’s unsubscribe link is placed prominently at the top of the email. However, because the text is light gray and it follows the sender’s address, it is questionable whether the vast majority of Google users have even noticed this change. Even so, if you are in charge of email marketing at your firm, ignoring Gmail’s move is a huge mistake. Gmail offering its own unsubscribe link decreases the opportunity to drive your current registered user back to your website through your own link, especially if your hyper-linked text is buried at the bottom of the email. In other words, instead of your customer clicking unsubscribe and being routed to your landing page, on Gmail a simple dialogue box comes up – the customer never leaves the inbox. Does Gmail’s Dialog Box Look Familiar? 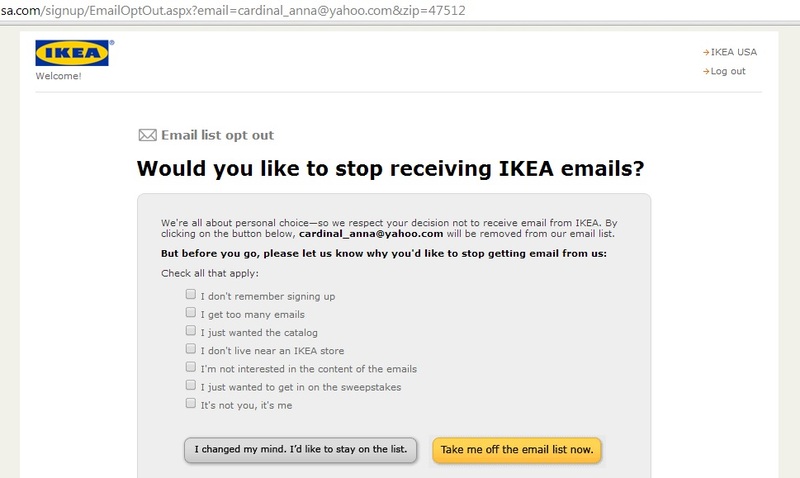 None of these suggestions ignore the fact that the opt-out process should be simple, easy, and to the point. But, the precious online real estate that surrounds the unsubscribe process can be used to encourage a new sale. Moreover, since Google has made it clear that it wants to help consumers de-clutter their inbox, your “Unsubscribe” link needs to be more prominent and easier to notice than the one Gmail has created. But, again, if you treat this link as a marketing opportunity that is connected to a custom landing page, why not place it at the top of the email in bold? The worse that could happen is that your qualified lead ends up on your website – now, all you have to do is give them a reason to hang around for a bit. Anna Seacat counsels businesses in search engine marketing and social media marketing. She is particularly interested in socially minded consumerism. She can be reached at seacatanna@gmail.com or +AnnaSeacat.